So it's been an interesting week. One of our US employees, designer Brian, has been in China for meetings with subcontractor factories and our Chinese design team in preparation for our meeting with Lowe's Hardware next week. Consequently, we've been running around all of Guangdong Province to various factories big and small in order to make sure everything goes smoothly. In the last week, I've been to Huizhou twice, Foshan once, and the very famous district of Foshan, Shunde, which is home to some of the larger factories in China. Yesterday was one of the more interesting factory visits of my life. 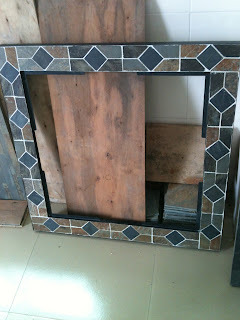 Brian the US designer, Jacky the manager of the sales team, and a few other employees were heading out to Huizhou to visit a factory that produced stone/slate tabletops for some of our tabletop firepits. We weren't really given any information about the factory beforehand, and apparently no one from our company had ever visited this factory before. About an hour outside of Shenzhen, still around 20km from proper Huizhou, we pulled off the highway and through some dusty, winding sidestreets until we arrived at an impasse. We didn't know where we were going, per se. We called the factory owner, who came with his little 2-door Lexus from the mid-1990's, to meet us at our location. We followed him for about 3 minutes until we pulled up to the factory. He emerged from the car, a fairly stocky Chinese man in his late 30's, one of the thousands of entrepreneurs who had come to Guangdong province for a chance to prove their mettle in the free-market experience of modern China. "Ah, factory very large", I muttered sarcastically in Chinese to our driver. From what we could see on the outside, this factory literally was a 3-story rickety old house, complete with clotheslines hanging from the 2nd and 3rd floor balconies. Upon walking into the factory "office", it became increasingly apparent that this was, indeed, some guy's house. What made this so apparent, you ask? So we were in some guy's house. "Can we see the production area? ", Jacky asked, which I was quite interested to hear the answer to. We were led around the back of the house, where there was a largeish (maybe like 1,500 square feet) shed. The shed had an aluminum roof, a small forklift, and about 8 people working back there, cutting stone to make tabletops. This was, as it would turn out, the factory. After our tour of the production area, we were led across the street to the area where they stored their raw materials. As you can see from the photo at left, this was not quite what one would expect from any type of factory, even a Chinese one. It was more or less a pile of rubble on the side of the road. That said, they did have some very nice-looking stone samples, and overall it seemed to have a decent level of organization to it. The owner proudly showed us varying shades of stone, and explained that they hand-cut all stone in order to make their tabletops. The potential of an order from us would allow this factory owner to expand his operation and possibly buy up the property next door, which would more than double his production capacity. He seemed to have an air of want, but far from desperation, in regard to securing our business. Finally, having seen the production area and material storage, he showed us one of the samples of their final products. I must say, it was pretty freaking impressive. A beautifully done, hand-made stone tile tabletop, something that I could easily see on someone's patio in the US. 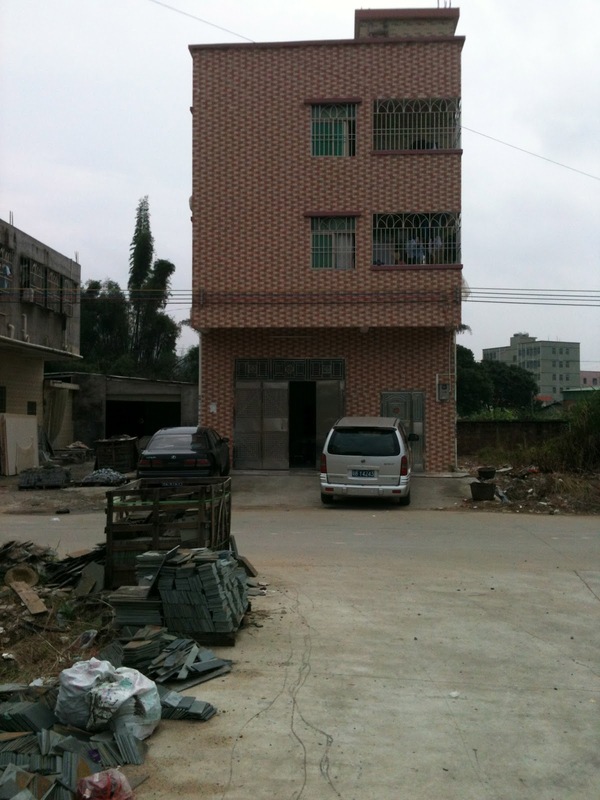 Remarkable to think that it was produced here, in all places, a random little factory-house in Huizhou. I was speaking with a friend of mine about this last night, and she informed me that these are quite common. Apparently the Chinese name is 家庭式作坊, lit. "family style workshop". Really amazing stuff. So overall a very interesting day in Huizhou. After the first factory, we went to a larger one which involved us doing a huge lunch with the factory 老板, or big boss. Designer Brian was slightly squeemish going into the meal based on his general bad luck with Chinese food, but he really enjoyed most of the dishes of what turned out to be a magnificent lunch. Will be returning to Chicago for 8 days a week from tomorrow, so that should be nice. Definitely looking forward to a deep dish pizza and some proper dessert (I love Chinese food, don't get me wrong, but that is the one place they lack to a staggering extent..dessert. Absolutely pitiful). So probably in store for some pie upon arrival in the US. And maybe some real proper ice cream (note: you can get like a nice Haagen Dazs ice cream here, it just costs like $9). Anyway, so dessert and deep-dish pizza are high on my list. And I assume I'll probably get China-sick about 4/5 days into my Chicago trip and have to make a run to Chinatown for some egg tarts, hot pot, and juice-boxed lemon tea. We'll see how that goes I guess. Meantime, the next week should be good, I've been hanging out a fair bit with designer Brian, and it's been really nice having a fellow US citizen here to talk to while at the office. Very nice to be able to chat about the olympics, US politics, how much we both miss food in the US, and the like. Makes work more enjoyable. Apart from that, not much else going on, will try to post another blog tomorrow about some of the huge factories we visited in Foshan this past weekend. I've recently been inspired by the writing of a friend of mine who is turning his former HK blog into a book, and consequently will be trying to write more consistently for the time being...we'll see how long that lasts.